Shirts With Random Triangles: South Carolina newspaper can't spell "South Carolina." 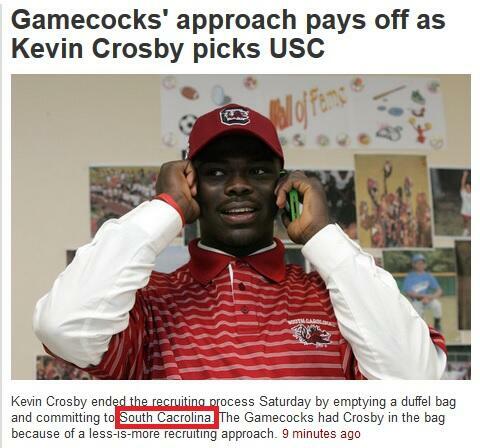 South Carolina newspaper can't spell "South Carolina." Columbia, SC newspaper The State recently covered South Carolina high school rising senior tight end Kevin Crosby verbally committing to...South Cacrolina? Look, we all know newspapers are going to Hades in a hand basket, but not even being able to spell the name of your own state? In the era of spell-check programs. Epic fail doesn't even begin to describe this one. As for "South Cacrolina," is "Cacrolina" that supposed to be some mutant combination of Carolina and Cackalacky? Is it how Johnny Manziel Scooby-Doo pronounces South Carolina? This one's gonna hurt for a long time.